Top three male and female, top male and female master, top male and female grand master, top male and female senior grand master, the top three finishers in each five year age division will receive awards. Running Series points are awarded in the 5 Mile to runners and walkers age 14+. The top male and female UCF Alumni and the top male and female UCF student will receive an award. Please check the ALUMNI or STUDENT box when registering to be eligible. The top 10 male and female overall winners will receive awards. The top three male and female 8-10 and 11-13 year olds will receive awards and are eligible for Running Series points. The top three overall male and female race walkers will receive awards in the 5 mile. 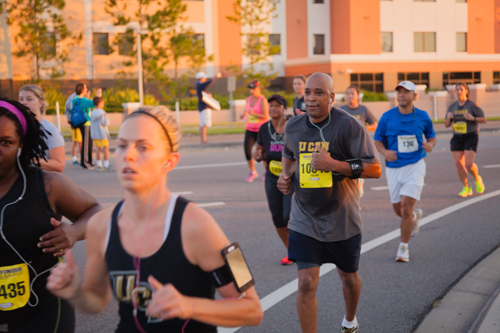 Those who wish to compete in the race walking division need to register at the Central Florida Race Walkers’ tent on race day. Same registration procedures and entry fees apply.